The international trade community has been seeing a huge increase in formal requests for information from U.S. Customs and Border Protection, as well as CBP regulatory audits, (especially anything having to do with Free Trade Agreements.) With the many tariff announcements recently, it is even more imperative that importers have a watchful eye on their goods in order to comply with U.S. law. Scarbrough Consulting, Inc. is a great outsourcing tool for your compliance and supply chain optimization needs. It is our job to make your job easier, and our team of experts make that happen for our clients. 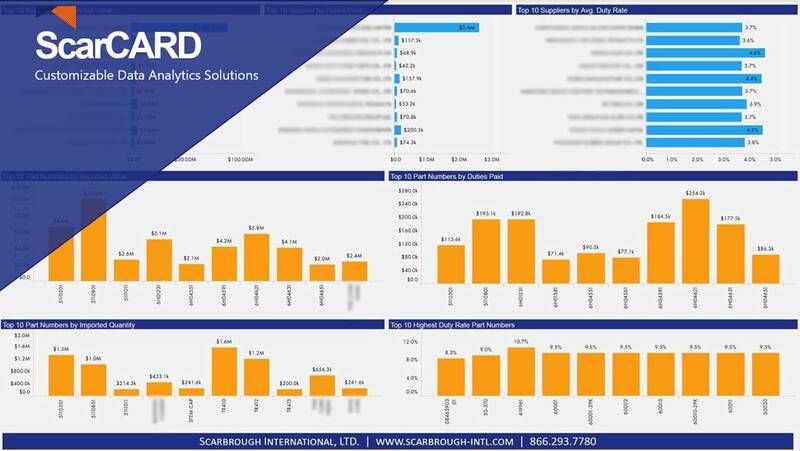 Scarbrough’s Data Analytics Tool (“ScarCard”) can also help with internal auditing. We highly recommend sitting through a demo of your own data. We can build customized reports with easy manipulation and visual access for you to view your import or export data direct from your ACE Portal. Quick example below.